This article appeared in the March 1989 issue of the Falco Builders Letter. 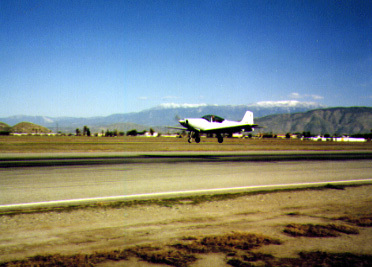 Jim Slaton takes off for the first time in the Falco. The phone rang the other day. "I just wanted to let you know that sucker flies." 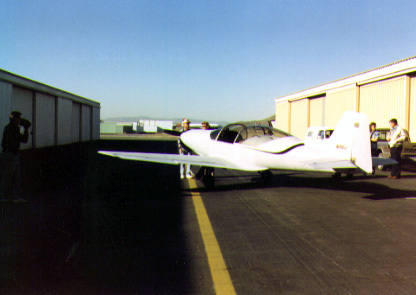 It was Jim Slaton, who flew his Falco for the first time on January 26. The first flight was 'by the book', a conservative gear-down flight to feel the airplane out. Jim flew fighters in the Air Force back when they still had propellers, he has an A36 Bonanza which he flies regularly, and he had flown with John Harns in his Falco last summer, so he was well-qualified and prepared for the first flight. On the first flight, the left wing was heavy, but overall Jim was delighted. "I'm so happy with the way it flies. The way it handles is really great." He reported that there is "absolutely zero vibration"-less than his A36. He said he was "absolutely amazed" that he did not have anything to adjust except the trim tab on the wing. "I made the nicest, softest landing you ever saw." He said he did have to use a lot of nose-down trim with the gear down and wanted to know if that was normal. I really couldn't say, since I always trim my Falco for cruise and never touch it for landings and takeoff. Jim said his wife Judy was "on cloud nine" and that she and some relatives video-taped the whole thing. After he landed, someone asked Jim if the flight made it all worthwhile. "Nah. Not all that for one flight. What made is worth it was the building." Jim and Judy Slaton live in Hemet, California, where they owned and ran Hemet Redi-Mix. Jim bought the Falco plans in April 1985 and started construction soon thereafter. 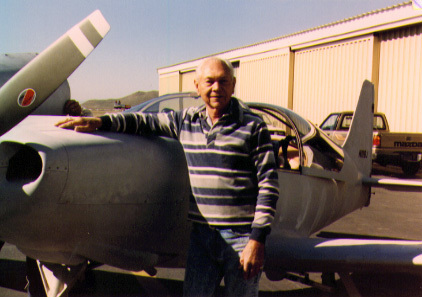 Jim flew P-40s and P-51s in the service, had a Bonanza which he flew regularly and was busy with the concrete business. I once asked Jim why he built a Falco, and he said it was just something he had always wanted to do. The concrete business had become rather daily, and Jim admits he was bored with it. Like so many Falco builders, Jim has been an inveterate tinkerer. Years ago he worked as a sheet metal fabricator and inspector at Douglas, taught sheet metal work in a school and had many years of experience in woodworking and cabinetry. Jim began work in his garage and planned to put up a pre-fab metal building at Hemet Redi-Mix to finish the Falco, but there were numerous interuptions. First there were zoning and building permit problems, and just as those were being resolved, he was approached about selling the business. This was a little ahead of his schedule, but Jim named his price and they bought, so he lost some time while that went on, and then he went round-and-round on the pre-fab building, finally building it as planned at the concrete business. Jim worked irregularly on the Falco until the building was completed, and he spent some time building spec houses. But finally the building was done, and Jim went to work steadily on the Falco. With all the talk of Karl Hansen, Pawel Kwiecinski and Tim Baker finishing their Falco in record time, it's fair to record that Jim did not find it so easy. He figures he's probably got 7,000 hours in building his Falco, and once at a moment of frustration when he threatened to "torch that thing" and grumbled about the time it was taking, I asked him if he was sorry he was building a Falco. "Oh no. It's been the highlight of my life." 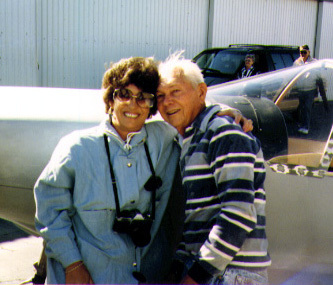 Judy and Jim after the first flight. Jim's Falco, N118J, weighed in at 1,270 lbs empty, while still in primer and with the empty weight C.G. at 67.0". He has full gear doors all the way around and the initial speeds look very good. It indicates 165 knots at 24/24 at 4000 feet. The Falco has a full IFR package and the Nustrini canopy. The engine is an IO-320-B1A overhauled by High Performance Engines, so this is easily the most powerful '160 hp' Falco flying. So far Jim had developed two problems. The circuit breaker pops when the gear is about 3 to 4 turns from full gear up. I think this is because of the main gear wheel well doors. Apparently there is a rapid build-up of air loads on the doors on the last few turns. Pawel Kwiecinski had the same problem, and I can't remember if he solved the problem or just took the doors off. The other problem is one that I have not heard of before. With the gear up, Jim is unable to trim the airplane to level flight. Full nose-down trim is not quite enough. I asked Jim to check the angular movement of his trim tab, and I haven't heard back yet. He was off to Mexico for a few weeks in the Bonanza with Judy and some friends. Jim plans to fly off the first twenty-five hours and then take the Falco to a paint shop. The airplane will be painted in mother-of-pearl with gold and bronze stripes.